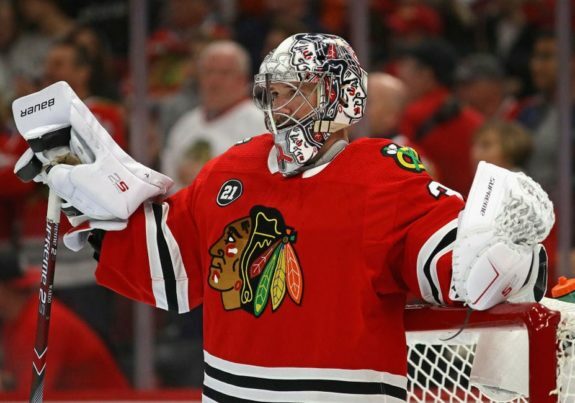 The Chicago Blackhawks 2018-19 season is finally underway, and the team started off with a bang. They provided quite an entertaining first trio of games, taking all three tilts to overtime. The Hawks came out victorious in two of the three contests, earning five out of a possible six points. All in all, that’s not a bad way to start the season. Here’s a look at some highlights from this past week. These two Blackhawks’ superstars did just what they need to do to right the ship in Chicago, and that’s score goals — they even managed to make some history along the way. 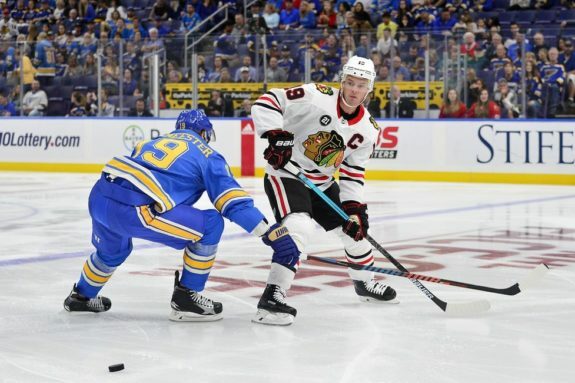 Captain Jonathan Toews notched a goal and an assist in Ottawa, a hat trick (including the game winning overtime goal) in St. Louis, and another tally against Toronto. His five goals and one assist in the first three games makes this the best start of his 12-year career. On top of that, Toews recorded three takeaways, three hits, a blocked shot, and a 62% average in the faceoff circle. His efforts earned him the second star of the week honors by the National Hockey League. Patrick Kane, or “Showtime” as he’s been dubbed for his highlight-reel plays, didn’t disappoint either. In Ottawa, he supplied the assist on Brent Seabrook’s game-tying goal, and then came through with the game-winning goal in overtime. In St. Louis, Kane also provided a goal and an assist. But his two game-tying goals at the United Center on Sunday were what really stole the show. That’s right, Kane evened the score at 5-5 late in the third period. Unfortunately, the Leafs’ Auston Matthews lit the lamp only 22 seconds later. But Kane wasn’t done, scoring again with just 29 seconds left on the clock. This makes him the first player in NHL history to tally two game-typing goals in the final 90 seconds of a contest. Kane and Matthews even had a little fun with it. Kane currently has four goals and two assists, which ties Toews for the team lead of six points. If these two stars can keep this up, it could spell good things for the Blackhawks. Kane and Toews might be the biggest names on the Blackhawks, but there are some little guys contributing as well. When the Hawks dropped the puck on their first game Thursday night against Ottawa, their lineup featured three players making their NHL debuts. Forwards Luke Johnson and Dominik Kahun surprised many and earned a spot on the opening night roster ahead of both Dylan Sikura and Victor Ejdsell. Young defenseman Henri Jokiharju made his way into the lineup primarily because of injuries to Connor Murphy and Gustav Forsling. Let’s look at how these three have fared to open the season. Johnson played the first three NHL games of his career centering the Blackhawks’ fourth line. It’s interesting that Johnson has been slotted at center, as going into the season most believed Marcus Kruger would be the fourth line center. For the first two tilts, Johnson’s linemates were Kruger and Andreas Martinsen. In the third contest, John Hayden was on his right wing instead of Martinsen. The 24-year-old center hasn’t exactly lit the world on fire. He’s averaged just over nine minutes of playing time, and only managed two shots on goal in three games. He’s also only taken a minimal amount of draws (13) for an average of 42%. He’s not even being utilized on the penalty kill, having played only 42 and then 50 seconds of short-handed time in his first two tilts. If Johnson wants to remain in the lineup, he needs to find a way to make more of a contribution. Kahun, on the other hand, has already found some success. He’s slotted in on the top line alongside Toews and Alex DeBrincat, and looks like he belongs. Kahun connected with both his linemates for big goals on Sunday at the United Center. He provided the primary assist for the first goal of the game by Toews. Not wanting to show favoritism, he did the same for DeBrincat a few minutes later. This tally was the result of a beautiful sequence, but the best part was Kahun’s reaction afterward. To say he’s happy would be an understatement. While we’re on the subject of the first line, DeBrincat’s been no slouch, either. He has two goals and two assists so far, including the first Blackhawks’ goal of the season. It’s great to see this top line work together and build chemistry. This 19-year-old has been playing on the top defensive pairing with Duncan Keith for his first three contests, and he hasn’t looked out of place. As a matter of fact, he’s looked quite good. He also seems to be getting better as he goes along. It was a surprise to everyone that goaltender Cam Ward started in net in all of the Blackhawks’ first three matchups. It’s customary to switch goaltenders on the second half of back-to-back games, but instead Coach Q made the decision to play Ward for the third time in four nights this past Sunday. Here’s an explanation from Quenneville. Perhaps the coaching staff is simply trying to get Ward into a groove, as he’s been anything but consistent so far. He had a terrible start in Ottawa, allowing three goals in just nine shots to begin the game. But then he pulled himself together and was solid for the rest of the contest, even when the team in front of him allowed 17 giveaways. Ward was a little more stable in St. Louis, and two of the four goals given up were on the power play. And, although it was a high-scoring affair, letting in seven goals against Toronto doesn’t exactly exude confidence in your netminder. To be fair, the defense is giving up way too many quality chances. That’s something that needs to improve no matter who’s in goal. But Ward has relinquished 14 goals and has a save percentage of .843 through the first three games. That’s not going to cut it long-term. Hopefully it won’t be long-term. Corey Crawford is traveling and practicing with the team and is hopeful to be ready to play around Oct. 18. Forward John Hayden suited up against Toronto after not playing for the first two games. He responded with a goal. That’s a pretty good way to stay in the lineup. The Blackhawks have had 10 chances, but they have yet to score on the power play. They even had a four minute opportunity on Sunday against the Leafs, but they didn’t even record a shot on goal. If the Hawks want to keep winning, this aspect of their game must improve. A beautiful tribute to the late Stan Mikita was given before the home-opener at the United Center on Sunday. It was quite the class act by the Blackhawks’ organization. The Hawks showed resiliency in coming back from behind in all three games. In two of them they found a way to win. In the last one they managed a point. While the Hawks endured a busy first week of action with three games in four nights, they only have two matchups this week, both against division foes. The team now has a few days off before they face the Minnesota Wild at the Xcel Energy Center Thursday, and the St. Louis Blues on Saturday at the United Center. Can the Hawks be more responsible defensively? Will they score on the power play? Can they come up with some more wins? We shall see. Stay tuned for next week’s analysis right here at The Hockey Writers!